Over the years while I have been running the Mattishall village website I have been surprised by the fondness and allegiance people have to our village. I have built up quite a bank of contacts from all over the world. Many have sent their memories and even old pictures of those early years. 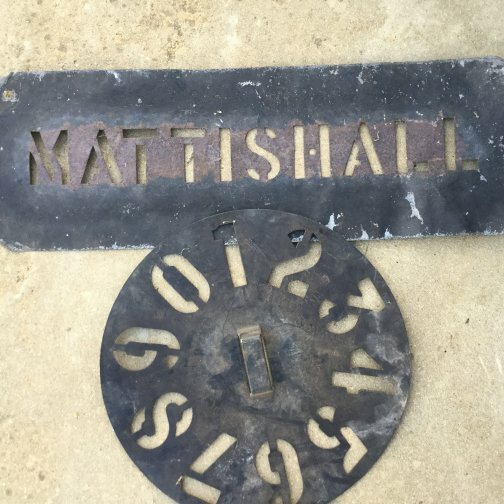 Hi Ray - I found your contact on the Mattishall webpage and thought as a long shot to touch base and possibly find out some information. It relates to a farm my parents owned in the Western Australian wheat belt town of Kellerberrin. They owned the property from 1973 to 2003. Before that it was owned by a family with the he surname ‘Doy’ for at least 36 years. The farm was purchased by my family when I was six. During the time we owned it we had a couple of stories about the farm's original owners and how it got its name. The name it was given was ‘Mattishall’ and apparently it is named after your village in England. Originally it was a wheat/sheep property of about 3000 acres. During the early 1980's we purchased two smaller 1000 acre properties next door. The area has about 12" (275mm) annual rainfall and now the average farm size in the area is about 10,000 acres to be viable. We used to run a 2000 head self-replacing Merino sheep flock and crop about 1000 acres a year. Most of the salt country lake system which runs through the property has been an old Salt River system for thousands of years. It is Great County to run stock on. The 1000 acres of cropping would produce 600-800 tonnes of wheat and barley annually except in a drought. Our worst year we stripped nothing in 1980 and next worst was 15 tonnes in 1985. The land of extremes! Another part of the history we heard was that the original farm owners were two British army sergeants after we guess was the First World War. I think there may have been a name around earlier, but I can't remember. While we lived there I found a few army uniform and bullet casings from I think we're from a 303. A couple of the items including a metal uniform button I still have. My parents sold the property in about 2003 and it was broken up a little. So I don't know if the farm name is still used. Follow-up: I finally got some more information for you from our land titles office. Below are the names of owners of my parent’s property from around 1915. 1915 - Patrick Coffey and Athol James Plunkett had the title - trading as Coffey & Plunkett. 1919 - Harry Mahaney Adair and Edward Charles Brierly. 1973 - R & N Boyle (my parents). The Postal Address is: Mattishall 6410 Kellerberrin West Australia. Sidney Doy was the youngest of nine children, born on December 6th 1888 and baptised at All Saints church Welborne, Norfolk on August 11 1889 – entry 542, the son of John Doy (1851 - 1929) a Blacksmith of Welborne and his wife Annie. He had four surviving brothers and two sisters. Twins Sidney and Edwin, born 1882 died a few weeks after birth. In the 1911 census Sidney was recorded as a 21 year old butcher living with his parents and sister Florence a 23 year old Assistant School Teacher. Soon after the census Sydney/Sidney married Harriet Grant Saunders in the December quarter of 1911 at the district of Mitford. At this time it is unclear if they married at Welborne or Mattishall Church. It is thought Sidney worked for Hewitt’s butchers on Church plain. Harriett Gant Saunders was born in the December quarter of 1891 at Calton Rode she was the daughter of George Saunders a Farmer of Brake Farm Gavestone, Norfolk and before that Carlton Rode and his wife Emma. Frederick was a Butcher/Farmer/Horse Trainer. He died April 05, 2006 in Greenmount Gardens Nursing Home, Western Australia. Kenneth was a Butcher. He died 12 August 2006 in Perth, Western Australia. Jack Ernest Doy conceived in Mattishall and born in Kellerberrin. I searched the National Archives Gallery in London for Sidney’s war service record in 2008 but it seems it was destroyed during the bombing of London in WW2. Recollections from family members suggest Sidney was wounded in Bayeux, a northern France village. The Germans shelled Bayeux during the night and hit the hall in which Sidney was billeted causing the wall to collapse. He was caught beneath a collapsing wall and his leg was broken. A postmark on a postcard he sent to Harriet was from Wimereux, also a northern France village where there was a major stationary hospital in WW1. Sidney didn't get to the front line, once he was released from hospital he found himself in the army service corp supervising 'coolies' unloading supplies for the war effort, most likely in the port of Boulogne-sur Mer. Sidney once said that the 'coolies' were making it very difficult for him to check off the supplies and he became very frustrated with their lack of co-operation. He gave one of them a 'bloody good whack under the ear' and the others quickly decided to seek retribution. Waving bale hooks they chased Sidney who fled to the protection of the officers quarters. Demobilistaion was accomplished quickly and easily but Great Britain faced enormous problems placing so many men in civil employment. With a young wife and four young children to support Sidney decided that life in Australia provided the best opportunities for him and his family. Sidney and Harriet immigrated to Australia to join Harriet's father George Saunders who was having a great deal of success farming in Kellerberrin (Strathalbyn) was the name of his farm. From all accounts Harriets father George Saunders a Farmer and widower had trevelled to Freemantle from Liverpool on October 4th 1913 on the ship Zealandic. Harriett G Doy (Wife) age 29 together with their children Stanley, Frederick, Kenneth and Murial . Sidney, Harriet and children Stanley (8), Frederick (7), Kenneth (5) and Muriel (4) arrived in Fremantle from England at 5:30am on a Saturday morning. Fred remembers it being a very hot day (it was 81.6 degrees) and they all felt the heat terribly. Granddad (George) Saunders was there to meet them and it was very late when the train eventually arrived at Kellerberrin. It had been a very hot day in Kellerberrin with the temperature recorded at 103 degrees. They were packed into a buggy and taken out to the Saunders farm 'Strathalbyn'. Ken's only recollection of the voyage to Australia was losing a half-penny off the top rail of the Omar.